This elegant fifth generation establishment, tucked neatly near the Arc de Triomph, is at once the zenith of luxury and sophistication whilst simultaneously managing to maintain it�s homey family orientated ambience and ethos. The waiting staff, headed up by Rostang�s Daughter Caroline, are a picture of professionalism, taking great care to ensure an excellent dining experience is had by all. In gastronomic terms the menu creatively matches the atmosphere and decorum of the establishment. A penchant for truffles has lead to such creations as the Rostangs Truffle sandwich, included amongst numerous other dishes that incorporate the famous fungi in creative ways. Tiny lobsters prepared on a branch of thyme evoke subtle flavour, and desserts include hot bitter chocolate fondant. 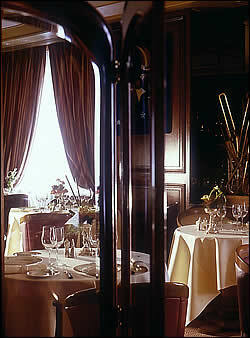 Sommelier Alain Ronzatti is always on hand to offer diners the perfect pairing with their meal.